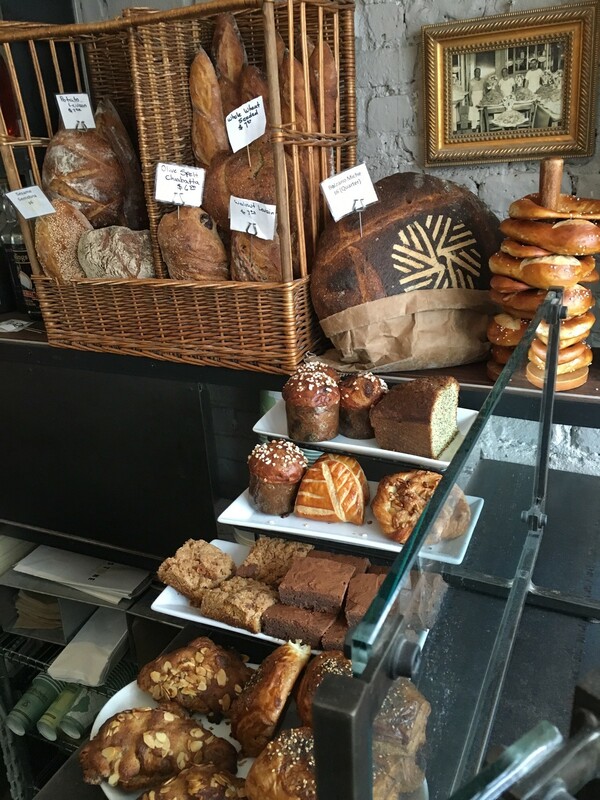 There’s no better example of how a baking resurgence is being woven into the culinary fabric of New York City than at the small but widely acclaimed Runner & Stone bakery cafe, a Michelin-recommended Bib Gourmand (i.e., an affordable and excellent restaurant), located a mere three blocks from the site of one of America’s very first tidewater grist mills in Gowanus, Brooklyn. Yes, that Gowanus. What was once a busy (and notoriously polluted) industrial zone has in recent years become a hotbed of creativity, both artistic and culinary. Runner & Stone (a name which refers to the two stones used to grind grain) opened here in 2012 with a focus on locally sourced ingredients, seasonal dishes, and house-made preparations (they make almost everything here: from their butter, ketchup, and mustard to ricotta, mortadella, pastas and even pastrami). 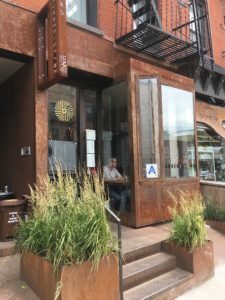 Inside, the setup is modern but casual and reminiscent of an Italian-style cafe with the front bar counter displaying the day’s breads and pastries and a dining area further back. Despite calm and dark interior colors and industrial elements like a rusted metalwork exterior, the sleek space has an inviting atmosphere courtesy of large front and rear windows (the rear one peers out over a serene Japanese-style garden planted with grasses). The space is definitely on the small side as a dinner destination but if you’re lucky enough to snag a table, it’s organized creatively with mirrors that spread light into the dark nooks. 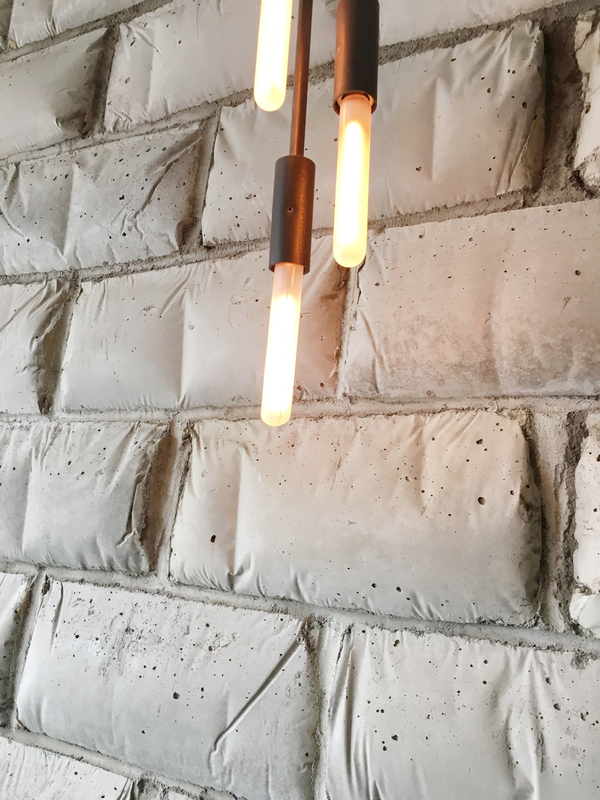 One of the most unique elements of the space are the three walls made of concrete blocks that were set in old flour sacks. Each one of these bulging “belly blocks” (so called by the design firm, Latent Productions, that fabricated them) display unique rippled wrinkles and fabric creases from the sacks with bubbly textures and curvy shapes that belie the material’s strength while calling to mind the alveole and varied contours of fermentation and a bread’s varied surface. Originality and experimentation are just as integral to the vision behind the menu as well. 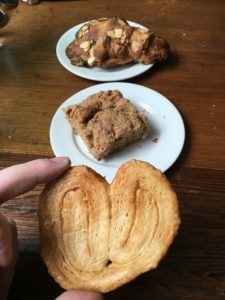 Both the baked goods and dishes from the kitchen reflect ideas plucked from a variety of global cuisines (Italian, French, German, Asian) but modified with unique twists that take advantage of what the restaurant’s long list of local suppliers have in season. When I came in for a recent midday visit, I had a tough time deciding what to try among all interesting offerings. 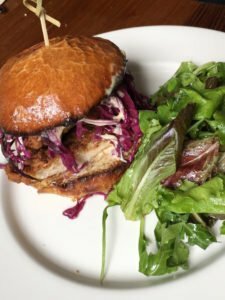 I ended up deciding on one of the cafe’s mainstays, a fried chicken sandwich on orange-water scented brioche with cabbage slaw and garlic mayo, and the less typical, banh-mi inspired mackerel, tomato, and shallot sandwich on baguette served with pickled daikon, carrots, cucumber, cilantro. I was at first surprised by the choice to put fried chicken on brioche but it quickly became apparent that the choice was entirely calculated. The fried chicken turned out to be extremely juicy and the shiny brioche did play its part well, holding together despite the deluge. Flavor-wise, it added a light buttery note but that was fine given that the star of the dish was nestled inside it. As far as the chicken itself went, the meat was, as mentioned, quite moist, which was surprising since I didn’t detect the saltiness or spices that would have come from a brining. I chalked it up to local farm freshness. Unfortunately, the normal fried chicken crunch was overshadowed by this high moisture content which had the side-effect of causing the breading to adhere to the chicken minimally and slide off. Still, it tasted great but the textural miss was a bit surprising given that Chef Chris Pizzulli brings to Runner & Stone years of experience from the Blue Ribbon restaurants, famous for perfecting fried chicken in its various incarnations. The mackerel on the long-fermented baguette loaf also lacked some compositional finesse but was tasty none-the-less. On the one hand, the French-style baguette was excellent: firm with a thin crust, airy interior, and chewy texture. But the nutty, robust bread and strong fish flavors were an odd pair that lacked a logical bridging flavor. As I ate it, I imagined how flavors like tarragon, dried cranberries, or even something like a lightly sweet miso or creamy plum sauce could brighten up the dish. The delicately pickled vegetables were good but not enough to balance the potent fish and bread. I also enjoyed a few of the bakery’s pastries and viennoiseries: a coffee cake crumble, an almond croissant, and a palmier. All three were excellent variations of the butter, flour, sugar theme. Although the croissant was less flaky than I’m used to, its thick bottom layer provided a needed foundation for the delightful house-made almond paste smeared inside. Ideal for dunking in coffee, the thin palmier (made from cutting the cross section of a roll of puff pastry layers folded inward) was crisp and glazed with butter on all sides, giving it an almost candy-like shell. My favorite of these three pastries was the coffee cake square. I’ve always been intrigued by the delicate structural balance achieved in coffee cakes. They are paradoxically both whole and sliceable into coherent units but also in a constant state of near chaos, ever threatened by the specter of small crumbly avalanches. Miraculously, they make it to our mouths held together as much by faith as eggs or gluten. Runner & Stone’s version veered towards the bready and buttery side of the spectrum, which meant it was a little denser, moister, and less prone to such spontaneous disintegration. Also an excellent coffee companion, finishing this little treat provided absolutely no challenge whatsoever. At this point, there was simply no longer any room in my stuffed belly for anything else (sorry you delicious-looking rye and caraway brownie), so I grabbed one of the freshly baked sesame semolina loaves to bring home. Truth be told, it actually took me a few minutes to choose the semolina from the collection of extremely tempting baked goods on display: spelt pretzels, walnut levain, potato levain, French baguette, olive spelt ciabatta, whole wheat seeded, and their famous and massive dark Bolzano miche (a sourdough made with rye, spelt, cumin, coriander and fennel) which features the restaurant’s mill stone logo on it’s crust. Although not available on the day of my visit, I’ve seen a variety of rye and buckwheat explorations mentioned on their website as well as loaves with pear, fig, and blueberry additions. Besides this seasonal experimentalism, head baker Peter Endriss (formerly a baker at Per Se and Bouchon bakery, Amy’s Bread, and Hot Bread Kitchen) approaches bread making traditionally and holistically, believing in natural leavening, long fermentation, and using only local eggs, local high-fat butter, and locally grown and milled whole organic grains (from Farmer Ground Flour in Ithaca, NY and Champlain Valley Milling in Westport, NY, among other suppliers). At home, when it was time to put the semolina to the test, I decided to take a cue from the tuna melt semolina sandwich I saw on Runner & Stone’s lunch menu and try mine with fish as well (in spite of my earlier misadventure with the baguette). Sliced and toasted under a layer of goat cheese and topped with locally smoked Delaware River eel (from Delaware Delicacies in Hancock, NY), gravlax, and mackerel (all on different pieces), the bread proved excellent. The finely ground semolina lifted the heavy fish flavors with a lighter, airier density and gentler sweetness than the yeastier baguette. Although, to be fair, the tried-and-true garnish of lemon juice, red onion, pickled capers and dill probably helped balance things out too. What I sampled at Runner & Stone was just the tip of the iceberg. Since eating there, I’ve heard good things about the dinner menu, which features intriguing dishes like house-brined and smoked duck pastrami, orecchiette pasta with housemade sausage and broccoli rabe, grass-fed steak with kale chimichurri and housemade buckwheat dumplings. The creativity and dedication to quality local ingredients of Chef Pizzulli and Baker Endriss make return visits to Runner & Stone a must-do pleasure.